Hello, hello! Not long for the weekend to come. Do you have any plans? I think I will just relax. As you can see, I kept my card pretty simple. I used patterned red paper from Folia for the background and then added some white cardstock which I embossed with Cottage floral embossing flower over it. In the bottom I used another piece of that red cardstock. I used my border punch to make decorative edge. 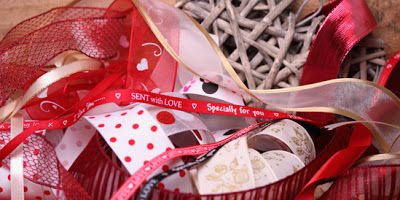 I also used a 3 mm white grosgrain ribbon from Crafty ribbons. In the upper left corner I glued some heart crystals from my stash. The foam hearts I used on my card are from my stash as well. I raised them on foam dots to add some dimension to the card. I hope you like my card and that you'll come and play with us. That is stunning, Cebelica! The embossing really makes this pop! This is clean and simple, very elegant. Extremely pretty card. I love the colors and the foams hearst works perfect. Thanks for joining us at Whimsical Designs. Have a great weekend. Those hearts really pop against the pretty white embossing - love it! !Thanks so much for joining us this week at the Pile it On Challenge. Beautiful card. I love the embossed background and the hearts. Gorgeous card! The white embossed backround is so pretty, and makes the hearts really pop. Thank you for joining us at Whimsical Designs this week. Gorgeously elegant card! The folded ribbon and embossed background add so much texture and style to it. Maja beautiful card as always love how simple but elegant it is. Be back tomorrow to check your tutorial love the flower.